Glorious fishing on a 13-metre custom-built launch. Sole charters or casual excursions, with full catering service and all tackle supplied. Professional, friendly fishing trips for novices and pros. The Serious Fishing Company is run by Rex and Lynette Smith, who guarantee you a trip to remember. Sailing into the Hauraki Gulf, north of Auckland, you'll have some of New Zealand's best fishing areas at your disposal, and it doesn't matter if you've never done it before - Rex will show you the ropes (and the knots) and make sure you land a catch for dinner. 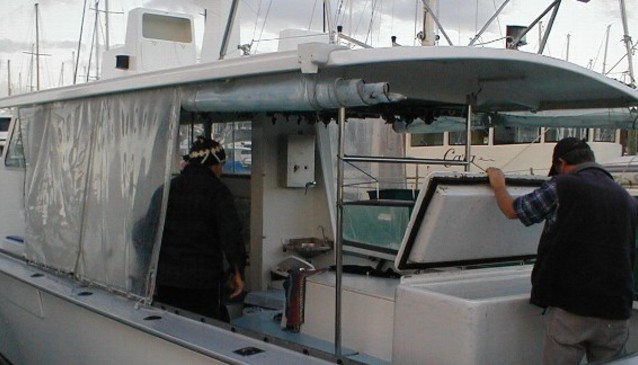 Their boat, the 'Kiwi Angler', has a walk-round cockpit and can comfortably cater for up to 25 people. Choose from a range of fishing areas, such as Tiri Tiri Island, Anchorite Rocks, Little Barrier and Rangitoto, or trust the seasoned crew to take you to all the best spots. For that extra special day out, try the exciting Saltwater Fishing Adventure, which takes you right out into the Gulf to source the really mean fish. Corporate charters are available, as is a full catering service. Trips leave from Gulf Harbour, half an hour north of Auckland CBD.